You can hide or show the toolbar with the View / Tabbed Toolbar menu entry, and you can detach and dock the toolbar by clicking on the left edge of the toolbar and dragging it to its new position. The new position of the toolbar will be saved when you close Take Command and restored when you restart. 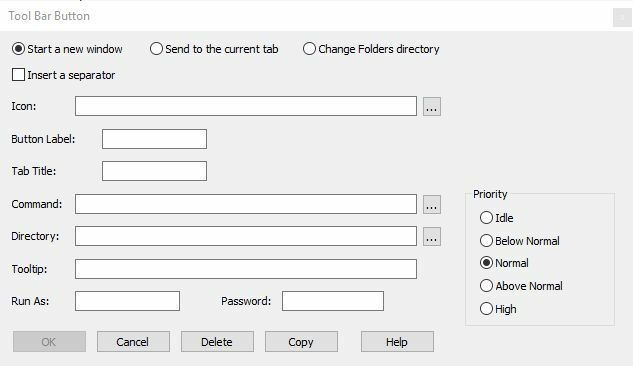 The Tabbed Toolbar is an optional tabbed tool bar that you can use to execute internal or external commands, aliases, or batch files with the click of a mouse (or an accelerator key). You can define up to 20 tabs, each with up to 50 toolbar buttons. If you have only defined one tab, Take Command will hide the tab (to save screen space). To create buttons for the tabbed toolbar, right click on the toolbar. You can modify or delete a button by right clicking on it. A dialog will appear to let you define the button label, tab title, command, and startup directory. There is a Copy option on the toolbar dialog which will duplicate the selected button so you can quickly create multiple variants of a command. You can also configure the tab toolbar from TCC with the TCTOOLBAR command. If you don't define a Tooltip, Take Command will display the Command. You can also customize the Tabbed Toolbar by clicking on the button on the right side of the Quick Options menu and selecting More Commands, clicking on the Commands tab, and dragging icons to the toolbar. You can reorder toolbar buttons by holding down the Alt key, pressing the left mouse button, and dragging a button to a new location.